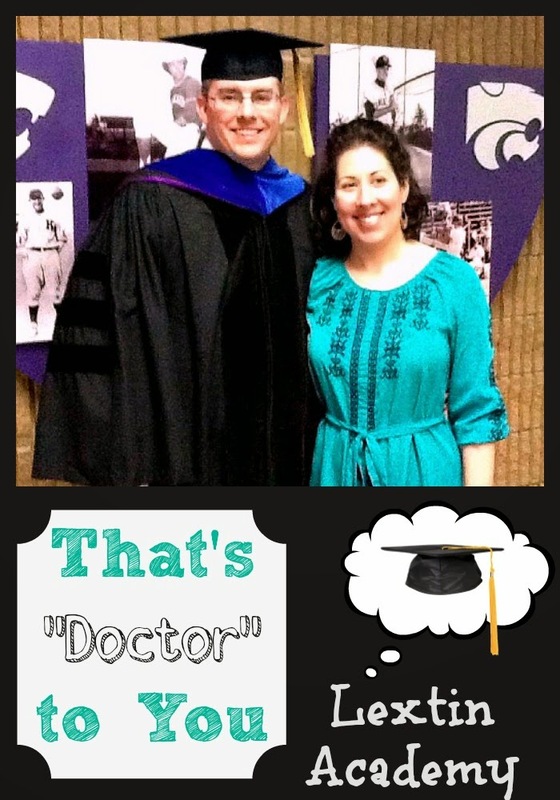 Did you know that my hubby recently graduated with his PhD? Yes, he did! I’m super proud of him too. I got to watch him walk across the stage and see his two professors place his hood over his head as he was handed his diploma. I was so excited. Excited about the degree, yes, but mostly excited that it was OVER! After many years of school (many, many years people), he was done. Squeal! No more late nights of studying. No more early mornings at the computer. No more trips to his campus in Kansas. No more proofing his papers. This was a big thing too! Have you ever tried to read technical research papers? Ugh, awfulness! He’s done, all done! That was 5 years of school, 2 children born, 5 moves, a new job, and many other little surprises along the way. What everyone asks is how he did it. He worked toward his degree part online and part in person/on campus while still maintaining a full time job as a manager for a financial institution. I homeschooled and managed our meals for kids with multiple food allergies. We had family time with our 5 children. We survived. Commitment: When he began the program we had many discussions about what it would entail. I told him I was fully supportive but he had to find ways to make family a priority even amidst his study schedule. We made a commitment together to work toward the degree but to also keep our family the top priority. Clearing our schedule: During the years that he was in school we committed to keeping our schedule as simple as possible. We didn’t plan too many outside activities for us or the kids. We knew that we couldn’t have the stress of having activities every night of the week. We chose a few events to join or participate in, and everything else was left for other years when we felt we had more time. Our goal was to keep things simple and lower our stress level. Scheduling time for school and study nights: He had scheduled study nights that we put on the calendar. They were usually Monday, Tuesday, and Thursday. On those nights I would put the kids to bed on my own and he would get a head start on his work after dinner. He spent all of his time before dinner with the kids and then had quiet time when he studied as I read to them and put them to bed. These nights were non-negotiable and were written on the calendar as if they were a commitment or appointment. Scheduling time for me: While my hubby had work and school, I was also trying to keep up with the house and homeschool the kids. I needed time to get caught up or do some planning. Just like my hubby had certain nights that were just for his study time, he gave me a couple nights for my own pursuits. On Sunday and some Friday evenings, he would play games with the kids and read to them while I went into our office to plan, blog, or answer emails. On those nights he also helped me catch up on housework. I appreciated that every week I would have dedicated time to work uninterrupted. Scheduling nights off for time with friends or date night: Just like he had nights that were dedicated to studying, we had a few nights that were just for us. We planned for friends to come over many Saturday nights for fun family times together. On some Saturdays we ordered pizza and watched a movie late at night once the kids were in bed. And other times we planned for a sitter to watch the kids so we could have dinner out together. Getting through the week was easier when we knew we had fun activities planned for Saturday and for some Friday nights. Getting up early and staying up late: My husband chose to spend as much time with us as possible so he often sacrificed some sleep in order to study when the kids were asleep. He went through lots of coffee as he stayed up nights and got up early on mornings. Some weekends he would get up early on Saturday and work for several hours before the kids were awake. Yes, he had long days but we knew that this was just a season for us and it would soon be over. No TV: We don’t have cable TV and we don’t miss it one bit. Because we weren’t tempted by various TV shows, we felt we had more time to get other things done. I don’t think we both would have gotten through the degree if we had to fight the distraction of the TV. The path to his PhD was long and hard for both of us. But it has been well worth it for us. Now my hubby has a new role at work as a financial advisor – which he loves. He also gets to pursue his passion for teaching financial planning as a college professor for several universities. I have to admit that I’m still not used to be married to my “doctor.” It’s still strange to look at his diploma and realize that we made it. We are done! I question when the reality of completion will set in. I’m still waiting to get over the wonder that we conquered the challenge of grad school together. Whenever I call “honey” to my hubby in the house if I’m trying to locate him, he calls back, “That’s doctor to you!” Then I round the corner and find him and give him the “evil eye.” He always laughs, hugs me, and winks.